This Special Day Care Center, located on the outskirts of Ranong town, cares and supports around 25-30 children aged from 5 to 16 years. The children have varying degrees of special needs, such as autism, mental and physical handicaps and Down Syndrome. The volunteers make a valuable contribution to this project through assisting the teachers and care staff in the day to day running of the center. Volunteers can help to build confidence for the teachers through daily interaction, where the teachers and care staff can practice their English skills with you. This project ideally requires volunteers with experience in this field. However, volunteers who have the drive and enthusiasm to work with special needs children and are interested in the teaching methods and practices used in Thailand, are most welcome to apply. Perhaps you are studying in the field of special needs education, psychology or nursing; all these disciplines have transferable skills that can be used for the project. 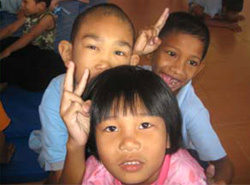 The center aims to provide children with a caring and stimulation environment to help realize their potential in life. Your time spent at the center will assist improving the children’s social interaction and hopefully develop some basic social skills, which they can use in daily life. The majority of these children do not have much interaction with other people, apart from their family and staff at the center. Improving their social interaction skills, improves their quality of life and what they get out of it. Your time is invaluable to help the children get used to and enjoy the company of others; this will greatly improve the confidence and behavior of the children, making their time at the school much more rewarding. Your day will start around 7.30am; you should arrive at the school for 8.30am and your day finishes around 3.30pm. Every morning the staff and the children sing the Thai National Anthem and raise the flag; this is an important part of Thai culture and volunteers are encouraged to take part in this cultural custom. You will work with a specific teacher during your placement and interact with all the children throughout the day. Physiotherapy is a big part of the daily schedule at the center and you will be given a specially designed handout, showing in detail, basic exercises to administer to the children. Movement, touch and interaction form the basis of the lessons and you will be shown how best to interact with the children. The staff does their best to make the day enjoyable for the children and if you have any special skills or knowledge regarding caring for special needs children please let us know so that we can suggest incorporating these into the daily schedule. 08.30 Arrive at the center for the raising the flag and singing the national anthem, followed by morning exercises and a milk break for the children. 9:15/9:30 Children are placed into small groups (depending on their abilities) and are given tasks such as arts and crafts, hand-eye coordination activities, and English classes. 13:00 One final game or interactive session together before finishing with a light snack. 15:30 Return to accommodation. Free time. Volunteers interact with the children as much as they can initially, observing their behaviour as well as the how the staff manage them. Volunteers are also given reading materials help gain an understanding of the different methodologies. You may visit a child’s family or at their home, dependending on school funds at the time of your placement. You can volunteer at the school for a minimum of 4 weeks at any time, except for public holidays when the school is closed. Both skilled and unskilled volunteers are welcome at the school, as everyone has a valuable contribution to make. 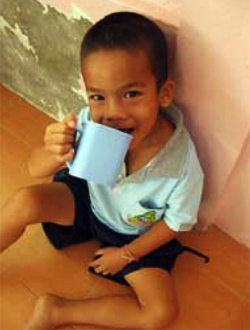 Skilled volunteers can share their expertise and wisdom with the staff and children. Non-skilled volunteers can provide the individual human contact that overworked staff may be unable to provide on a daily basis. The children do have special needs and sometimes they may scratch or pull your hair unintentionally. You have to be mentally prepared for these incidents. Accommodation is basic but clean, comfortable and close to the school. Volunteers will have a bed, pillow, blanket and fan. Lunch is provided at the school and you will eat with the staff at specified times. There are local restaurants within walking distance for breakfast and dinner. Transfer will be arranged from Phuket International Airport to the school. Our coordinator will introduce you to the school staff and the children. Public transport (songtaew) is available for independent travel to shopping center, movie theatre, the beaches and other regional attractions. You should consider purchasing a travel insurance policy, which includes medical emergency. Make sure that all activities you plan to do both with us and in your own time are covered. Some activities, such as diving, are not covered by some insurers. We encourage our volunteers to learn some Thai words as well as to teach some English during their trip. And we have developed a Thai-English phrasebook and we highly encourage you to print it out and use it during your stay in Thailand. Previous volunteers have developed a useful homestay pack with flashcards, which you can print out and laminate before you leave. It will help you communicate with the local people and it contains ideas for games and activities.